The Buffalo Bills are coming off their first loss of the season after losing a close game at Carolina last week. Now, they take on perhaps an even tougher club in the Denver Broncos. We saw what a strong defense can do to the Bills offense and the Broncos defense may be even better, though entirely different. The Broncos, who have won their first two games over the Los Angeles Chargers and the Dallas Cowboys, run a 3-4 scheme as compared to the Panthers 4-3. Unlike most 3-4 schemes, the Broncos front three are relatively small. Defensive ends Adam Gotsis and Derek Wolfe are both listed as being 285. In many 3-4 defenses each player along the front three are well over 300 pounds. Three of the four linebackers aren’t big by NFL standards either. The inside duo of Brandon Marshall and Todd Davis go 6’1 250 and 6’1 230 respectively. On the outside is Von Miller (6’3 – 250) and Shaquil Barrett (6’2 – 250). While this front seven may be considered small, they are all quick, fast, strong, explosive and instinctive. The secondary is experienced and smart. The corner duo of Chris Harris Jr. and Aqib Talib is as good as there is in the NFL, while the safeties (Justin Simmons and Darian Stewart) aren’t far behind. Needless to say it can be very difficult to run or pass on this group. 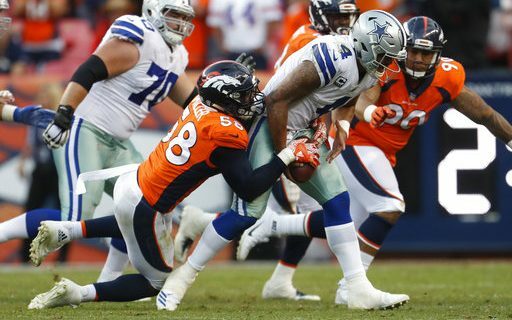 Last week against the Dallas Cowboys the Broncos defense held the best rushing team in the NFL to just 40 yards on the ground. In two games, they have given up only 104 yards on the ground. Have fun trying to run on this group, it’s not happening! Going into the 2017 season, there were questions as to who wold be the Broncos quarterback. The favorite going into camp was Paxton Lynch, the Broncos 2016 first round draft choice. Lynch has struggled and then an injury has him sidelined to about mid season. Third year man Trevor Siemian, a seventh round pick in 2015, has taken advantage of the situation and so far is having a very good year. Last week against Dallas he completed 22 of 32 for 231 yards and four touchdowns. He has thrown six TD’s in the opening two games. The Broncos ground game has been strong, averaging 158 yards per game with CJ Anderson getting the bulk of the carries. In reserve is Jamal Charles, who isn’t quite back to 100%, but can be dangerous any time he touches the ball as either a runner or a receiver. Demaryius Thomas is the go-to receiver and at 6’3 – 230 he can create match-up problems. The number two receiver is Emmanuel Sanders who can also be dangerous if he gets in the open field. All told, the Broncos offense is very balanced and they can beat anyone with a combination of the run and pass. Looking at the Bills first two games, it can be easy to see how to defend them. Stop the run game, keep Tyrod Taylor in the pocket and make him throw. The Bills have to find a way to get Taylor on the perimeter so that he can throw on the run or at least from outside the pocket. This gives the Bills the best chance to get their passing game going. If Taylor can’t get it going this week his days as the starter may be numbered. As I write this, the current spread on the game is the Bills +3. Playing the game in Buffalo helps the Bills cause, but reality is this Denver team is at least seven points better than the Bills. In the opening two games the Bills passing game has struggled and they did nothing on the ground last week. Unless something changes quickly on offense, I just don’t see the Bills being able to do much on the Denver defense. Things don’t get better in the future as Buffalo travels to defending NFC champ Atlanta next week. Read Greg Gabriel’s experienced NFL observations on the Bills and the league.